BELLEVUE, Wash. - March 15, 2016 - PRLog -- InterMountain Management, a leading hotel development and management company in the US, is proud to announce the addition of the Sheraton Bellevue Hotel in Bellevue, Washington to its management portfolio. The Sheraton Bellevue is a full-service, 178-room hotel, well-located in the Bellevue central business district, within walking distance of the city's business, retail, and amenity areas. The hotel offers 8,000 square feet of function space for a variety of meetings, parties and celebrations. The Bellevue Grille offers the finest in Northwest cuisine for breakfast, lunch, happy hour, and dinner. The Sheraton Club is available to guests looking for upgraded rooms as well as access to the Club Lounge, serving complimentary continental breakfast and evening hors d'oeuvres. Michael Ashley, InterMountain's Senior Regional Director of Sales, adds, "The Sheraton Bellevue Hotel is the perfect hotel to serve both business and leisure travelers alike. InterMountain's dedicated associates are excited about the opportunity to build on the great service culture and exceptional guest satisfaction the hotel offers. With a multi-million dollar renovation that will be completed this year, the hotel will only increase its preference among hotel guests." 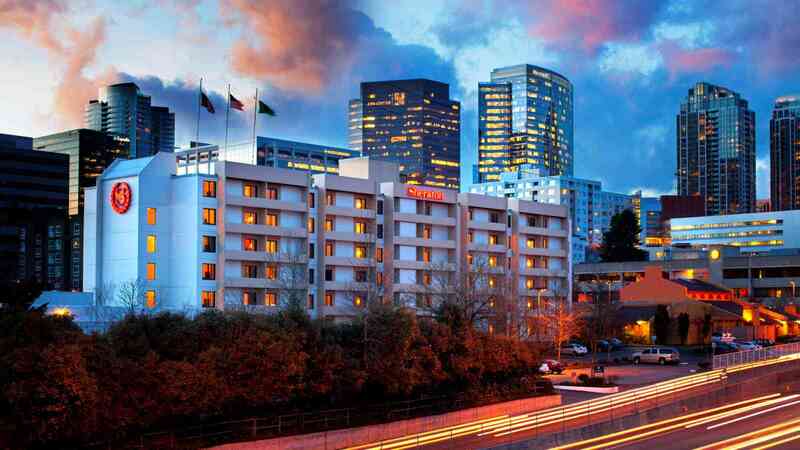 InterMountain will be managing the hotel on behalf of PMF Investments, a Bellevue-based commercial real estate investment company that recently acquired the hotel. Brian Franklin, President of PMF, states, "We are excited to establish a relationship with InterMountain Management and look forward to working closely with the team to provide superior service and quality, while focusing on maximizing bottom line profitability. We feel InterMountain shares the same family-oriented culture as PMF. We like the fact that InterMountain is an owner/developer as well as management company, and look forward to a mutually beneficial, long-term relationship." As one of North America's largest hotel management and development companies, InterMountain Management specializes in the select-service and extended-stay hotel segments. For over 30 years, InterMountain Management's dedication to success is proven in the results as a hotel owner, management company and hotel developer. They currently own and/or manage approximately 50 premium branded hotels nationwide, with an additional 30 in their pipeline. For more information, or to view hotel locations across the U.S., visit their website at www.intermountainhotels.com. Sheraton Hotels & Resorts, the largest and most global brand of Starwood Hotels & Resorts Worldwide, Inc., makes it easy for guests to explore, relax and enjoy the possibilities of travel through smart solutions and effortless experiences at more than 440 hotels in more than 72 countries around the world. The brand is currently in the midst of implementing Sheraton 2020, a 10 point plan designed to make Sheraton the global hotel brand of choice, everywhere. Sheraton recently launched "Where Actions Speak Louder," a multi-channel, multi-million dollar advertising campaign that highlights the brand's ongoing enhancements to its guest experience, including new products and partnerships, and a renewed focus on service. With work well underway, the brand has already rolled out a variety of initiatives under Sheraton 2020, including Paired, a new imaginative lobby bar menu; the richest SPG promotion in the brand's history; and Sheraton Grand, a new premier tier that recognizes exceptional Sheraton hotels and resorts. To learn more, visit www.sheraton.com. Stay connected to Sheraton: @sheratonhotels on Twitter and Instagram and facebook.com/Sheraton. Since 1978, PMF Investments has put a premium on acquiring and developing undervalued commercial real estate properties. The company has led commercial, industrial and mixed-use projects throughout Washington, Oregon, California, Idaho and Ohio. PMF has a reputation for long-term real estate investing, which has enabled them to develop long-lasting relationships within the communities where they do business. PMF has also developed a strong portfolio by responding to strategic opportunities rather than short-term market fluctuations.